Spring 2017, Mamukko was thrilled to receive the vibrantly coloured Camper Sail arriving from Spain. Tones of Ruby Red, Peach and White made for the perfect summer vibe in their Kinsale shop this season. And what a journey the Camper sail has had! Nine months at sea during the Volvo Ocean Race in 2011, the Camper team crossed the finish line in Galway, putting them in second place overall. Since the sails retirement, the Mamukko brothers have revived the Irish connection by making unique upcycled bags from the sailcloth. The Camper edition has a wide range of designs, from small pouch, clutch, cross body, classic tote, hold-all duffel and more to come. There is something for everyone whether functional, fashionable or purely ecological. These products have a unique story to tell. Mamukko is founded and run by Hungarian brothers Attila Magyar (managing director) and Levente Magyar (creative director). With four generations of leather-crafting behind them, they have added a twist of sailcloth, emergency life-raft and fish netting into their handmade designer bags. The Camper sail has added a burst of colour with red sailcloth mixed with genuine leather, making a beautiful quality handcrafted product 100% made in Kinsale. Camper calls home to the Balearic island of Mallora, but for this particular sail, the Irish connection remains strong here in Kinsale. These bags are uniquely made, piece by piece inside the Mamukko Workshop just outside of town. Many times these one off products are made in the morning and bought from the shop the same afternoon. Such a localized and transparent level of production makes for a close knit web between the two Mamukko crafters and their supporting community. A detail oriented combination of used marine fabrics, new leather, innate passion, and expansive imagination has developed Mamukko into its own vessel, navigating through a modernizing concept of a sustainable marketplace. With a wide variety of styles from gear bags to the classic tote, along with hats and belts to accessorize, these products continues to impress newcomers while inspiring a conscious shift within those who cross its’ path. Mamukkos’ manifesto is based within the concept of change, toward a more sustainable, conscious global market and making such products available to those who appreciate the connective cause. 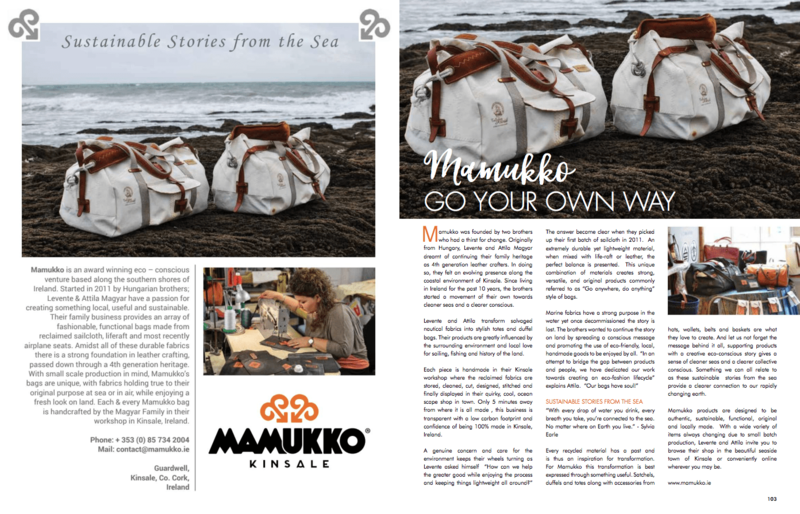 Mamukkos’ products always connect back to the previous purpose or story of a specific sail and what route it took at sea. As for the Camper sail, a nine month trip around the world proves to be both inspiring and instinctive to have as part of one’s proud possessions. Mamukko shows commitment to fashionable functionality with momentum into a future global market. Repurposing marine fabrics requires great imagination in design, making it a fun, creative process along the way. As nautical parts of the fabrics are often incorporated into a product, it connects consumers to a real life story, which they can carry with them. These unique details enhance the connection between maker, product and buyer, in turn supporting the cyclical nature of conscious consumerism. The Mamukko brothers would like to give a big thank you to all their past and present supporters both local and global, for without their curiosity and excitement of these new concept products, Mamukko would not be possible. On a path of change for the greater good, please keep an eye out for new products with a purpose both in the Kinsale Shop and online.